LOL The first picture has me cracking up and slightly confused. The second picture has me "awww"ing. Awww seriously he grew too fast. Complete with cookie in hand! cute! Cute picture of Roo. Love her jacket! 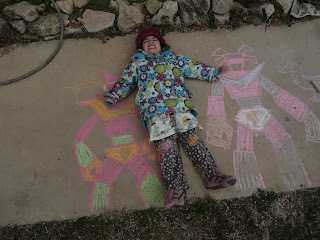 Who drew those super cool chalk robots? Roo's fashion sense is, as always, amazing and Jasper is so sweet in his little corner of the couch! Happy holidays from Portland! Did she draw those robots? I had to look twice at the 1st photo. It totally looks stock photo material. Look at Jas, can I give him a smooch(when I get over my cold)? 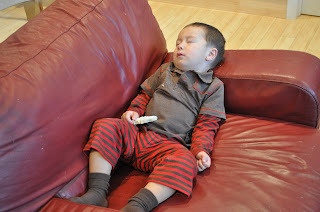 The holidays can be exhausting--you have the evidence! Interesting blog as for me. It would be great to read a bit more concerning that theme. Thnx for sharing this material.